Who speaks for a divided community at the crossroads? “Between Two Worlds” is a groundbreaking personal exploration of the community and family divisions that are redefining American Jewish identity and politics. The filmmakers’ own families are battlegrounds over loyalty to Israel, interpretations of the Holocaust, intermarriage, and a secret communist past. Filmed in the U.S. and Israel, this first person documentary begins with a near riot at a Jewish Film Festival in San Francisco, reveals the agonizing battle over divestment from Israel on a university campus, and shows the crackdown on dissent in Israel itself. “Between Two Worlds” has the exhilarating energy and fierce commitment of Jewish conversation itself. 2007, 15 minutes FREE ON LINE! Poet Shirley Kaufman gives a tour-de-force reading of her new work in the short film “Ezekiel’s Wheels”. The poem, a contemplation of loss, longing, and the nature of true seeing, was inspired by her experience of losing her sight. Emerging from eye surgery, Kaufman had visions like those of the exiled Biblical prophet Ezekiel. Apocalyptic fires in the sky, wheels within wheels, and a valley of bones are encountered on a journey that leads from destruction towards revelation. Kaufman, an American who has resided in Jerusalem since 1973, is the author of eight books of poetry, and is an award-winning translator. Global corporations are rapidly buying up local water supplies. Communities suddenly lose control of their most precious resource. “Thirst”, a character-driven documentary with no narration, reveals how water is the catalyst for explosive community resistance to globalization. A piercing look at the conflict between public stewardship and private profit. Shot in Bolivia, India, Japan and the USA. Spanish, French, and Portuguese subtitles. Institutional, community group, and home video rates available. With companion study guide. 2005, 20 minutes FREE ON LINE! 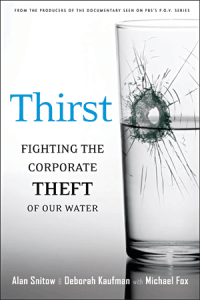 Beginning where the documentary film leaves off, Thirst investigates eight recent high-profile controversies over the corporate takeover of water in the United States and illuminates how and why ordinary people are fighting back both here and abroad. 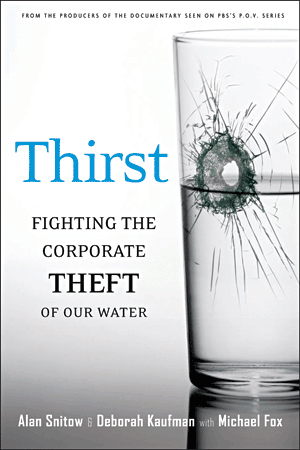 Engrossing and alarming, these character-based stories focus on citizen battles to maintain public control of local water systems and on struggles to challenge the bottled water industry. A one hour documentary film revealing the hidden downsides of the Internet revolution. “Secrets” is also a funny and moving meditation on America’s love affair with technology. Told without narration, the film chronicles a tumultuous year in the lives of two young activists, Magda Escobar and Raj Jayadev, grappling with temporary work, the digital divide, toxic waste, and the growing gap between the haves and the have nots in the New Economy. Institutional, community group, and home video rates available.